If you have a pawn shop in your local area that specialises in coins and other forms of bullion, it is definitely worth paying them a visit when you are in the market for some silver. Even if your local pawn shop doesn’t specifically deal in silver and gold, it can still be an option when shopping for precious metals. However, there are some important things to consider before deciding to visit a pawn shop with the intention of investing in silver. Most pawn shops, by their very nature, don’t specialise in precious metals. They are mainly used by people to sell anything and everything of value, so the chances of finding silver for sale at your local pawn shop can be small. This means a trip to such a shop can often be a disappointing experience. Another reason why using this type of outlet to buy silver isn’t such a great idea is that the staff on hand might not be very knowledgeable in the area of buying and selling silver. While coin shop staff will mostly only deal with precious metals and rare coins of numismatic value, pawn shop staff are required to know a little about everything, rather than a lot about one type of product. This means that if you yourself do not know much about buying silver and other precious metals, you probably won’t get much relevant help or assistance at a pawn shop. 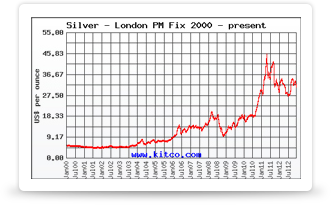 This is unlike a coin shop, where you can visit just to get information on the intricacies of investing in silver and gold from the mostly experience staff. If you are lucky enough to find a pawn shop with knowledgeable staff and a good selection of products that interest you, there might still be reasons why this isn’t the best place to make your purchase. Even though the goods might be second hand, if they are pure silver or gold, it is likely there won’t be much discount on the price. This means you will probably find better deals online for the same items. At the very least you should try to compare the prices online with what is on offer in the pawn shop just to make sure a better deal is not available elsewhere. While regular pawn shops aren’t the best place to find and purchase silver, they do have a few advantages compared to shopping online. Being able to hand over your money and walk away with your purchase on the same day is one advantage online precious metal dealers cannot compete with. Also, the fact that if you pay by cash, you often will leave no paper trail from your silver purchase is a reason why some people prefer to shop at a pawn shop compared to using a website and a credit card. This level of anonymity is valued by many because having online records of where the silver has been shipped to, could make you the target of unscrupulous employees. Another reason why shopping at a pawn shop could be a good idea is that you can inspect the items before making your purchase. Being able to see the coins or bars in person is worth 100 photos and a 100 word product description on a website. This alone can be reason enough to shop from a pawn shop as opposed to buying online. As you can see pawn shops aren’t ideal but if you are lucky enough to have a few located close to you, they are still worth paying a visit from time to time, to see what is on offer, just don’t go expecting highly knowledgeable staff and an extensive collection of silver.